South Korean actress, Kim Hyo Jin (김효진) attended production briefing of 'The Taste of Money (돈의 맛)' held on April 30, 2012 at Seoul Lotte Cinema, Gwangjin in Seoul, South Korea. The actress was seen in a red lace dress from Valentino Spring/Summer 2012 collection. A pair of patent open-toe pumps to complete her simple yet chic outfit. 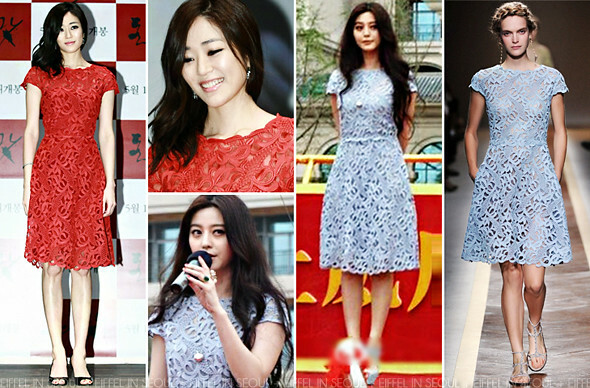 Fan Bing Bing (范冰冰) was also seen wearing the same lace dress in baby blue at the promotional event for Hengda Real Estate held on June 23, 2012 in Qidong, Jiangsu province of China. Elie Saab suede platform sandals from Spring/Summer 2011 which matched her dress to complete her lovely outfit.